This is probably the simplest of the easy oriental series so far. While I was doing my online research (seeing how others have photographed the dish) I came across the phrase “takeout standard” on a couple of blogs. I won’t provide links here as it probably is not fair to diss the efforts of fellow food bloggers. But, let’s get real. If the height of culinary ambition is to match the dross sold in most Chinese take-out, we are wasting each other’s time. So, either read on my friends, or reach for the phone and that menu you found in the letterbox. I say that this is easy but I also have to say that Beef and Broccoli is really, really delicious. The flavour combinations of the main ingredients bring out the very best in each other. Not a lot of ingredients required to make this dish of awesomeness. First thing to do is to place the beef in the freezer for half an hour. This will make it very easy to cut, if a little chilly on your delicate fingers. While the beef is chillin’, prepare the other ingredients in as much as one needs to prepare them. First, get your rice rinsed and cooking. Follow the instructions on the bag, you don’t need me for that. 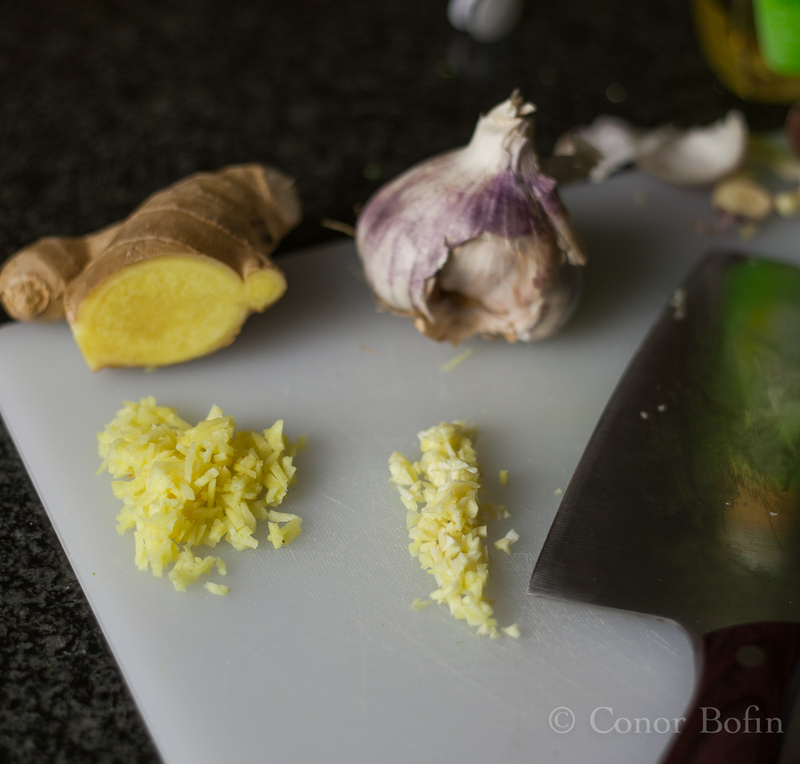 Then, chop the ginger and garlic. These live at the heart of so many great oriental dishes. I use about twice as much ginger as garlic in this dish. 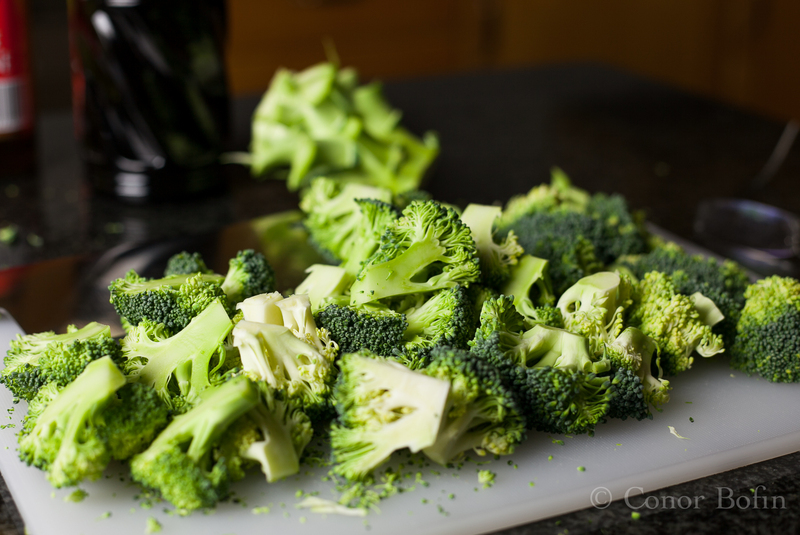 The cut the broccoli into pieces that will be small enough to put into your mouth with looking like a savage. They should be about the same size as the finished beef slices. This allows for even cooking. I trimmed them from the main stalk and then cut most of them in half again. Measure out the soy and rice wine into a cup. This makes for easier pouring. 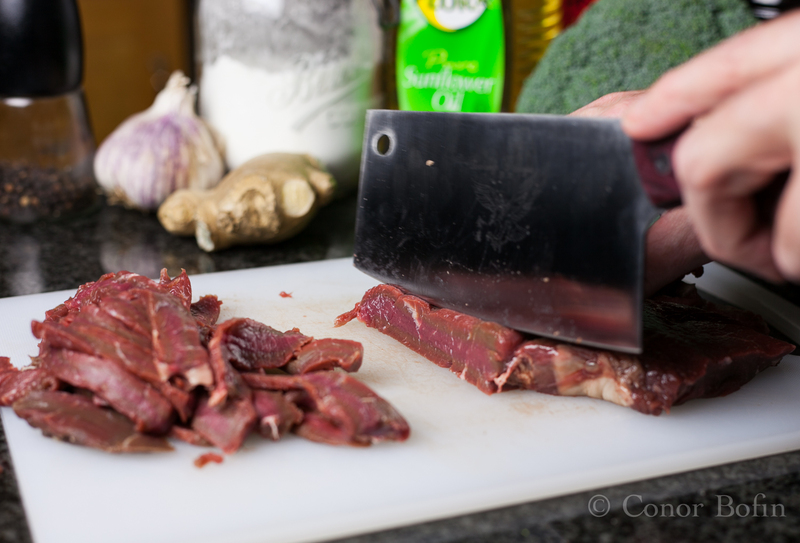 Take the beef out of the freezer, trim off the fat and undesirable bits. Slice into thin slices. Nice and thin. The beef will absorb some of the oil in the next step. 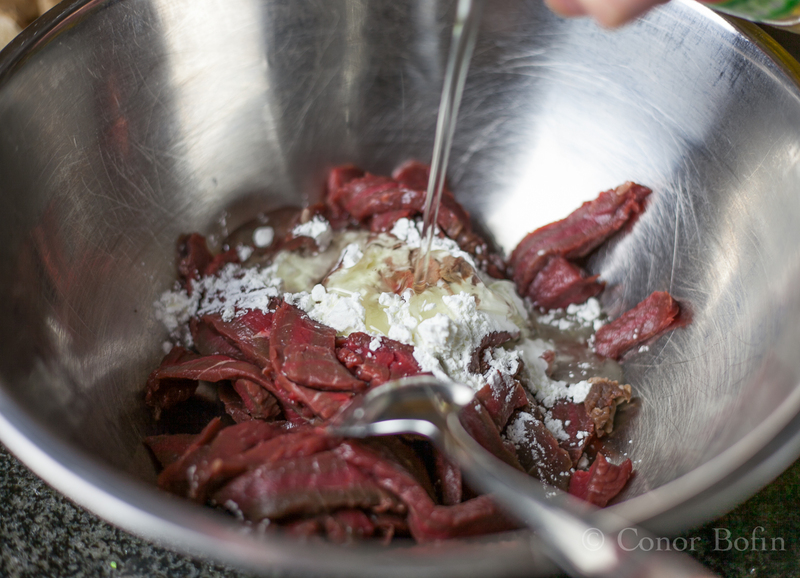 Put the beef in a bowl and add the cornstarch and about half the oil. Then give it a good stir. I am naturally disinclined to add the oil but there is a trick to it. More in a little bit. 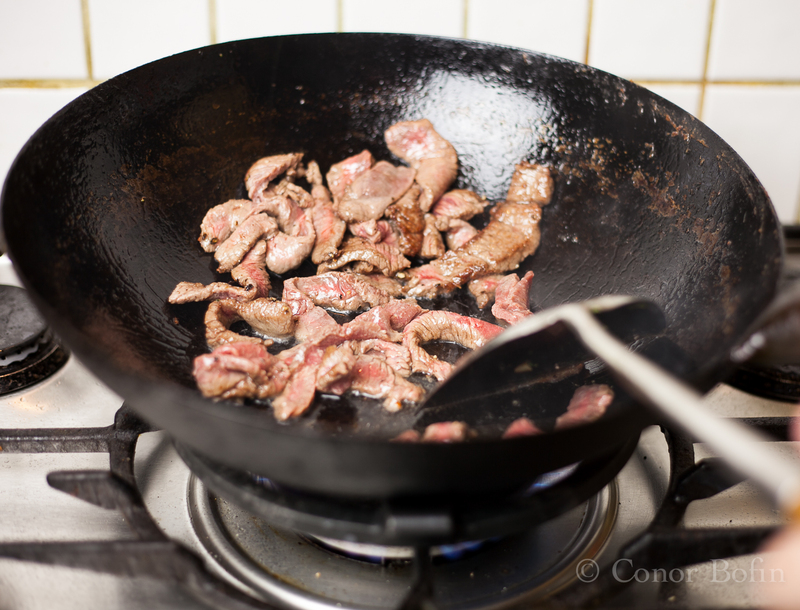 Heat about half the remaining oil in your trusty wok. Add the broccoli and start stirring. You will need to keep things moving to prevent the broccoli burning. 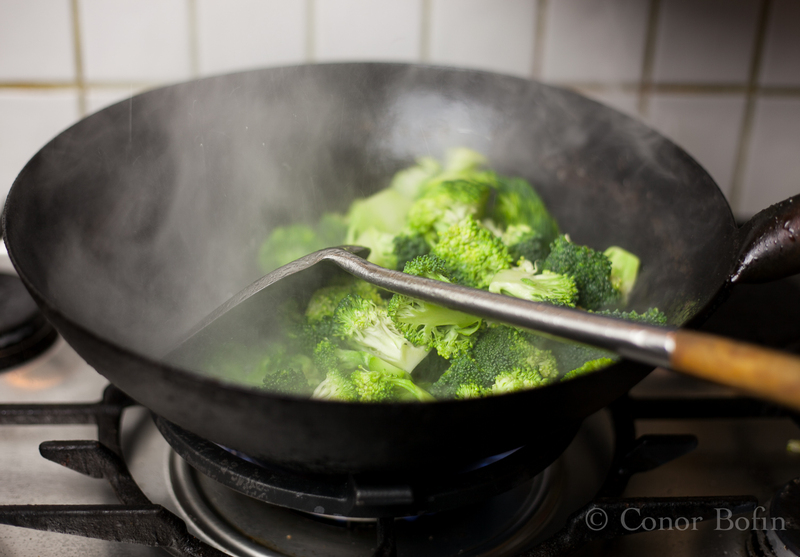 The broccoli will spit quite a bit when it goes into the oil. Stand back! 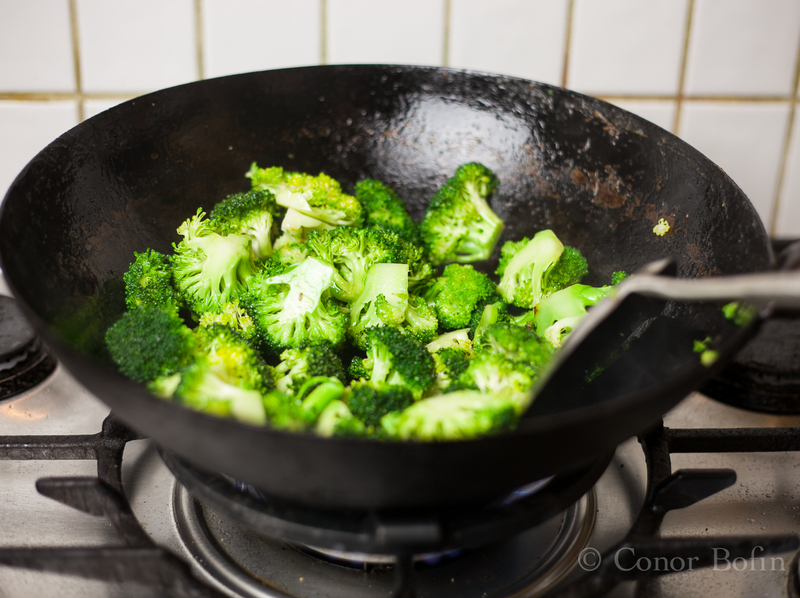 When it has changed to a nice high green colour, remove it from the wok. See what I mean about the high colour? Don’t over-cook it or it will become mush. 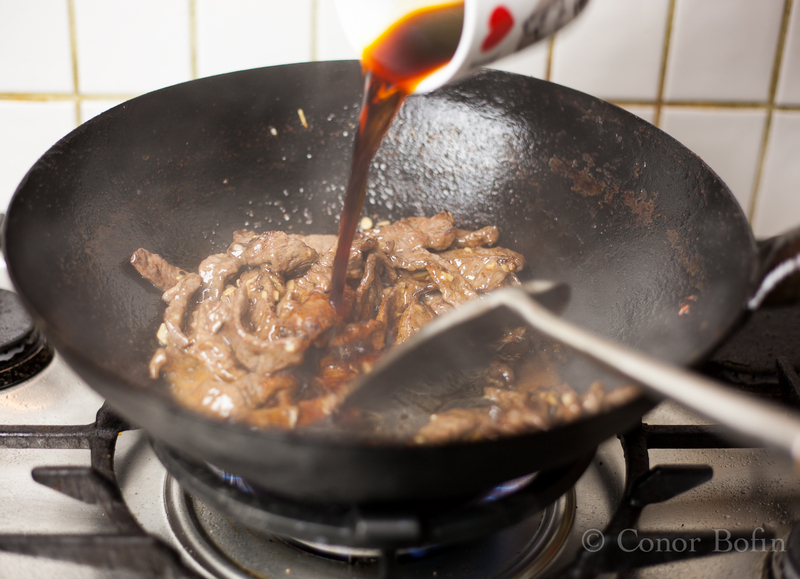 Add the last of the oil (not much) to the wok and add the beef, a bit at a time to prevent the wok temperature dropping too much. Stir like crazy. 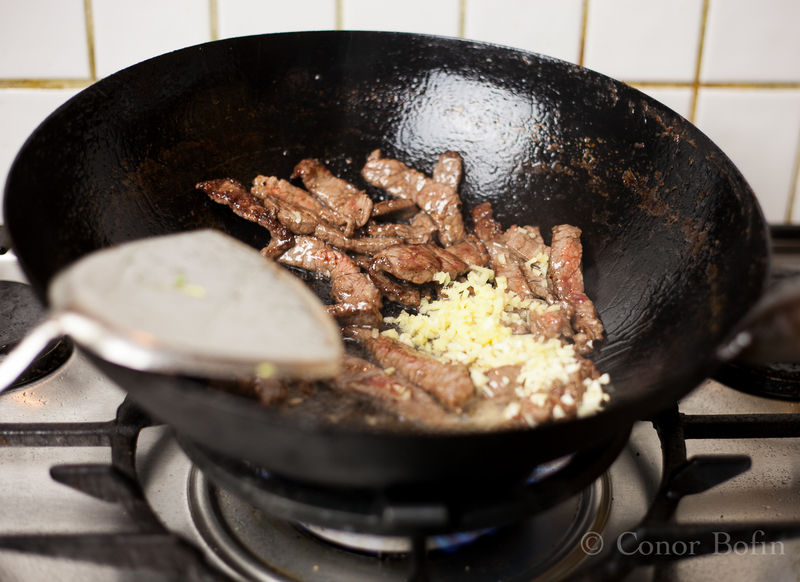 Keep the beef moving, shifting it up the sides of the wok as you add more. When about half the beef is added, add the garlic and ginger. This prevents the garlic and ginger burning and you will get the best out of their beautiful flavours. The garlic and ginger will start to stick to the beef. This is a very good thing. 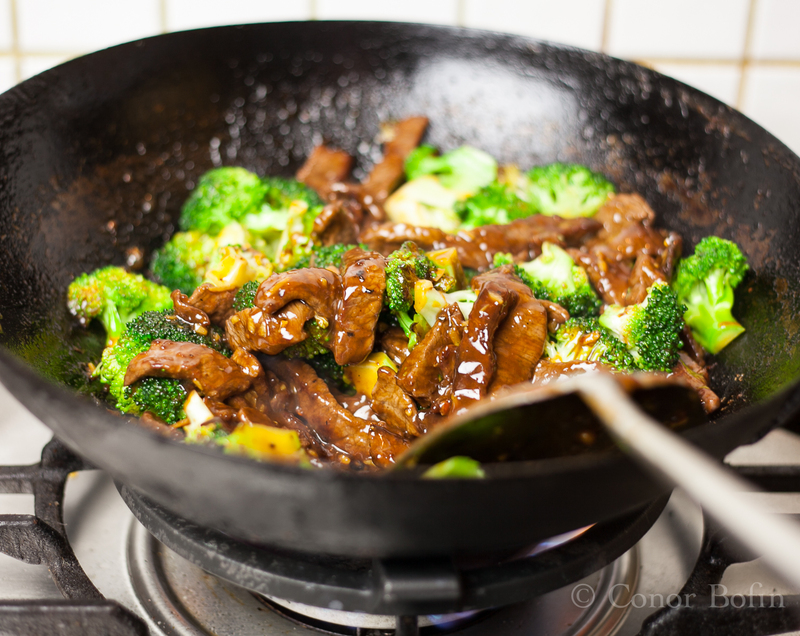 You should now notice that there is a lot more oil in the wok than you have added. That is because the beef releases the oil it absorbed earlier. 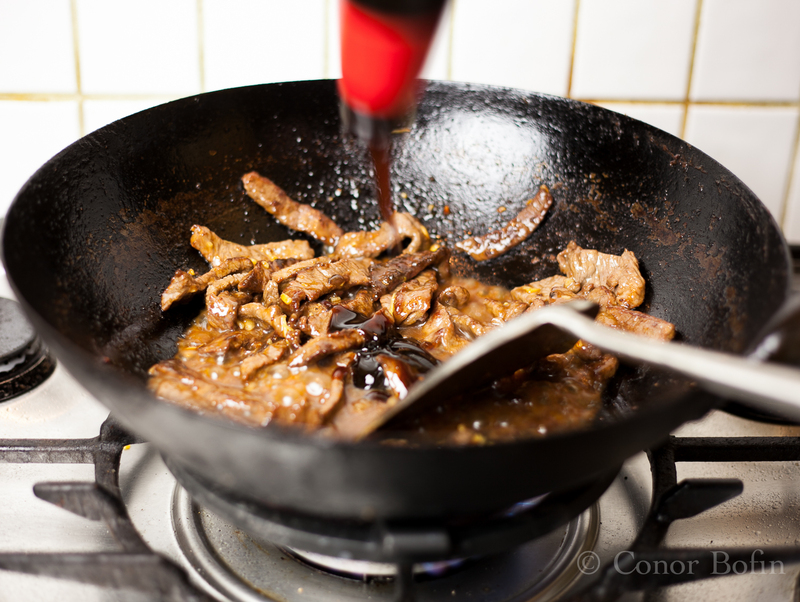 Pour off the excess oil and then add the soy and rice wine. More spitting and steam at this stage. It comes with the territory. Let this reduce a little and then add the oyster sauce. Side note on oyster sauce: Don’t buy cheap stuff. The price and quality vary greatly. Don’t be a tightwad. Spend the cash. You will reap the taste rewards. The oyster sauce is not made from oysters. Neither does it taste of them. Stir and add the broccoli. 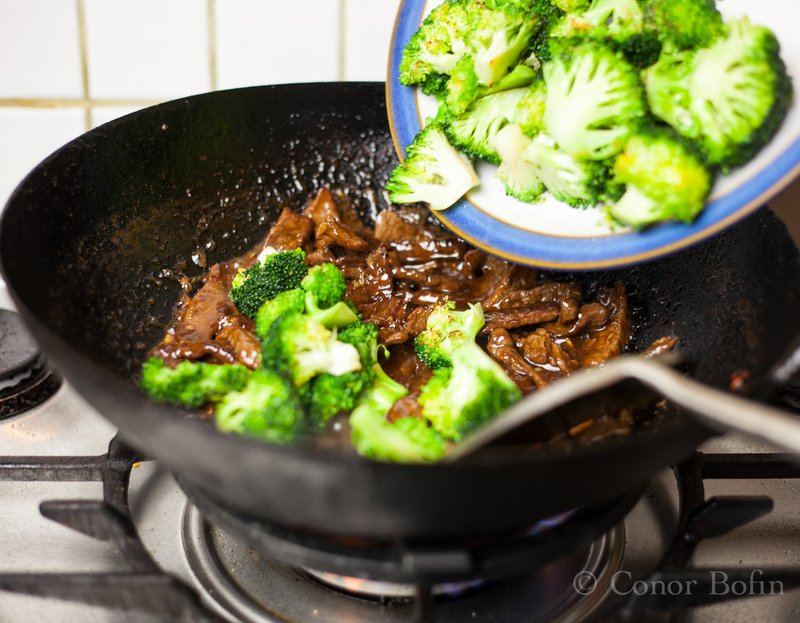 Our aim now is to warm the broccoli and to part coat it with the delicious sauce. When it has warmed a bit (this does not take long), get ready to serve. You want a totally gratuitous beef and broccoli shot, don’t you? Serve along with some of the rice. There is enough in this for three people with belching, or four with a reasonable expectation of being satisfied. This is far and away ahead of anything you will get from a takeaway. The only way you have of proving that is to cook it. I will be cooking it again, and again, and again. It is delicious. The Board Meeting - Ducking the major issues. I absolutely love that recipe, thanks, Conor. I will definitely be cooking it in the next couple of days. I did actually make a slightly half-assed version of this tonight and even with a couple of substitutions it was delicious. Many thanks. Half assed is good. This is such a ‘classic’ that there are 101 variations. Could you perhaps explain to my husband about not looking like a savage as you stuff something too large into your mouth? He might take it from you… I’m sure it’s a tribute to my cooking, but it’s not a good look. And he would certainly do it with this recipe. Kate, you have to get him to do some jaw exercises. “Make like a python” is a good exercise. It involves dislocating the lower jaw and allowing the mouth to open much wider. Either this or cut up his food for him, if he behaves like a baby, treat him like one! Thank you Conor, another wonderful recipe from your kitchen to ours. Love Chinese food and somehow never venture out and try it in my kitchen, I guess I will now. Always a pleasure reading you. Happy Monday to you too Giangi. Do try it. It is easy and very tasty. looks great! where do you think is the best asian supermarket in Dublin? need to stock up on a few essentials! My advice is twofold on the Asian market front. If you are anywhere near Clondalkin, you should go to Caterworld on the Nangor Road. It is a big wholesale place but you can buy individually too. Justin Chan runs it. I know him for many years now and I love his humour. If you are in the city centre, there is nowhere to beat the Asia Market on Drury Street. If you are driving, park in the Drury St. car park and it is a very brief walk when dragging a 10kg bag of rice. I think you might’ve missed your calling. Each and every one of these Chinese-style takeout meals you’ve presented is excellent. Hope all is well. Too kind of you to say so. I have had a bit of fun doing them. With the Chinese New Year beckoning, they are attracting a bit of interest. All very good here in the Emerald Isle. I hope it has stopped snowing in Texas! The photo alone made me hungry! Then I am doing my job Shanna. Thanks for the kind comment. What a great homemade take on the take-out meal. Wok ‘n roll, Conor! A pun too far Tommy…. This looks very tasty and I love the simplicity! The beef looks great in the gratuitous shot, so nice and shiny. Good idea to add the garlic halfway. Kudos for being able to take photos while cooking this, as this dish doesn’t allow you to slow down. There is supposed to be some oyster extract in oyster sauce by the way. Thanks Stefan, I appreciate the comments and the bit of education. This really is easy and well worth trying. Certainly a few steps up from “takeout standard” my friend. 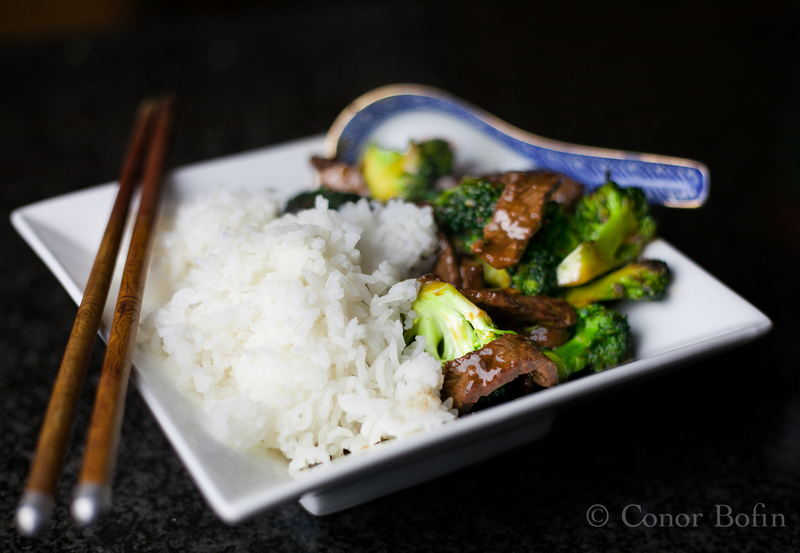 Beef and broccoli is one of my fave stir fry combos of all time. Chicken, broccoli and cashews is another cracker! 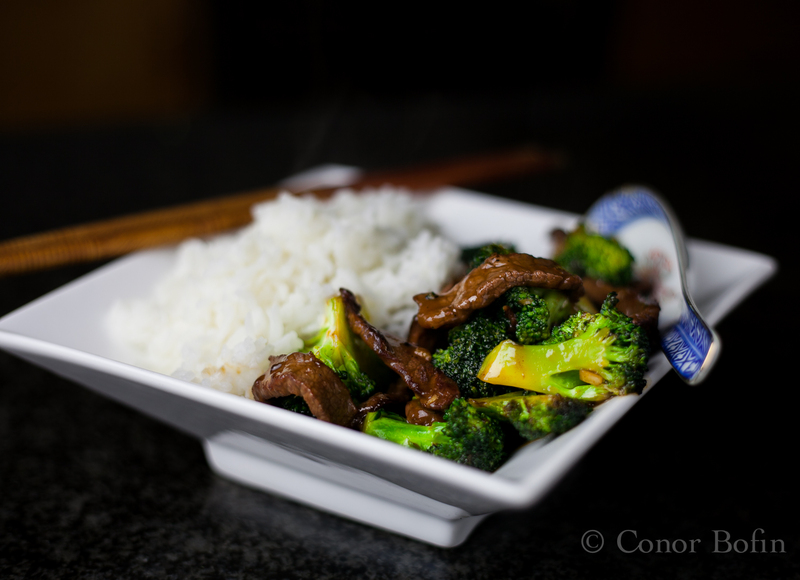 Cooking usually for one this indeed is one of the easiest and healthiest stirfries I make often. For myself I would double the garlic, but then i love a lot. 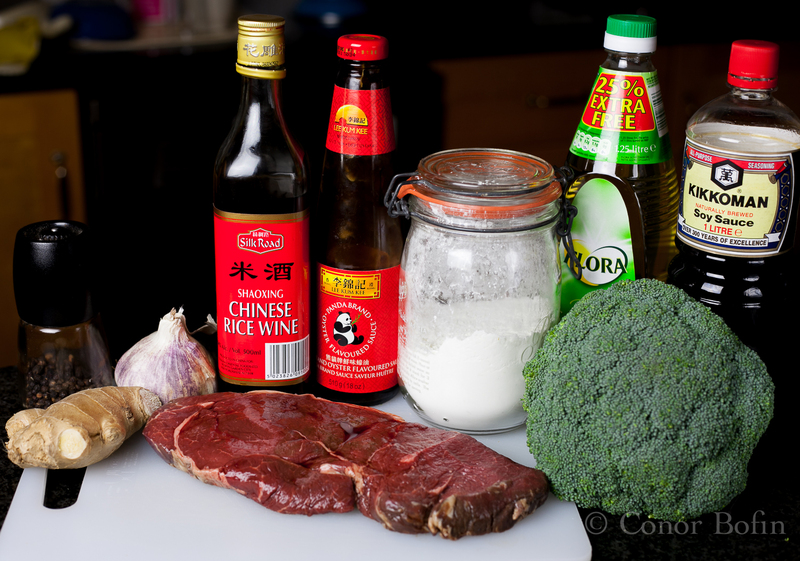 Also oft I may leave out the oyster sauce and use 1/2 l/salt soy and 1/2 kecap manis [Indonesian sweet soy] instead. Also ‘playing around’ with honey and/or fish sauce etc makes the day’s offering different! Yours looks lovely!!! Thanks Eha. It really is simple to do. I too would like double the garlic. Glad we are on the same wavelength Richard. Gratuitous shots are the lifeblood of this blog. We have a great restaurant culture here. Including dozens of wonderful Vietnamese places and some decent Thai places, but our Chinese restaurants remain almost uniformly either horrible or mediocre. Like you, because we love Chinese food so much, we’ve taken matters into our own hands. Thanks for this addition to our rotation! I would love to see a version by you Michelle. It is such a personal and simple dish that it takes variation very well. Spend the $25 and you can be doing it too! God I love your brutal honesty. And it’s so true. More like if you can’t be bothered to make a high quality meal from scratch then be forced to settle for take out. Although living on an island, sometimes I just miss the novelty of someone coming to my door with bags of food. Thanks Wendy. Island life is obviously good for one. Take out schmake out! Ridiculous! Although I have gotten pizzas when the girls were home. Nothing beats home made. Your photos are stunning! Too kind Mini. Take out always starts as a great idea and ends in disappointment and guilt! Tried this tonight Conor and it was as good as you said. Wife thinks I’m a genius! ah yes, beef with broccoli. your easy oriental series has yet again proved that a symphony of complimentary seasonings, a few fresh ingredients, and high heat are sometimes all you need to make an excellent dish. funny how a lot of people overlook the simpler meals. often times, they are some of the best. shōgayaki and beef with broccoli are staples in my bachelor diet. Love this kind of dish for making one steak stretch to feed the entire family! Great pics, Conor. Oh Conor! This is one of my girls’ favourite dishes when we go out for Chinese. I have saved this and am definitely going to make it for them. And me, of course! Well, I did indeed make it Conor. I just couldn’t resist! And neither could my youngest, Emma, when I showed her your photos. It was delicious! Better than take out anyway! Thanks for a great recipe Conor. This one’s a keeper! Great stuff Lidia. I get a great kick when others try this stuff – and it works! This is a great recipe Conor, I am definitely going to make it. I started following your blog a while ago but don’t get notifications of your posts. If it weren’t for Lidia I would have missed this completely. Strange can the ways of WP be. Your comment needed approval on this side. Perhaps unfollow (nooooo don’t go!) and refollow? Thus has worked for me in the past. I did that, lets see if I get posts from now on. If not I will try to un follow and re follow again. Yes WP can be a bit of a pain at times.